As the sole designer on Pages Publishing, I strove to empower Small and Medium Businesses to create content to reach the right people and drive business outcomes. I primarily focused on increasing quantity of posts through providing Page Admins inspiration—ideas and guidance on what to post—and simplicity—reducing friction to posting. People struggle to find things to post. I created designs for iOS, Android, and WWW that surface prompts of suggested photos from their device’s camera roll and Pages-connected Instagram account to provide inspiration. Instagram Photo Reminder: For accounts connected to Instagram on WWW, daily posting increased 0.37% (approximately 11.13K posts/day). On iOS, daily posting increased 0.92% (approximately 200K posts/day). Counter metric of Meaningful Social Interactions trended positive in all tests, which means that the posts created from this feature generally are good quality. 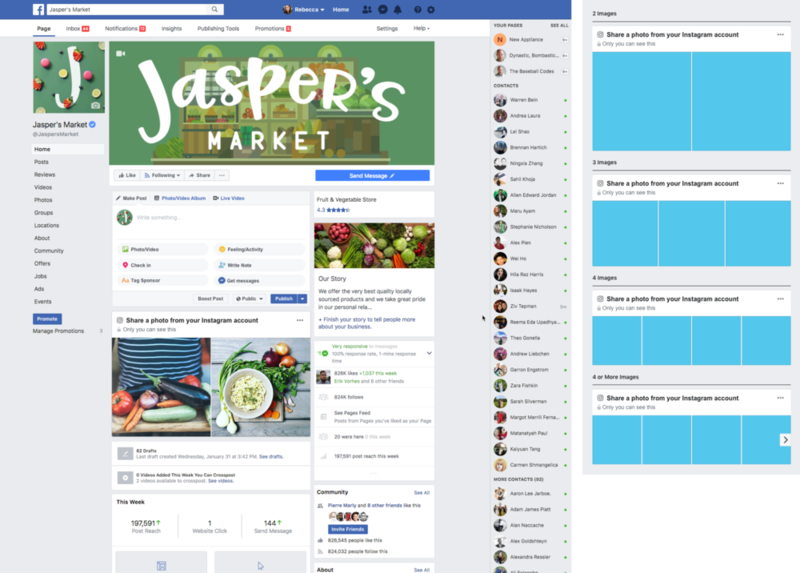 To enable businesses to reach the right people, Facebook allows Page admins to set privacy on posts (Audience Restriction) as well as target their ideal audience to see posts on their News Feed (News Feed Targeting). These features had been broken and were blocking the public release of the new Pages composer architecture. The previous audience restriction and targeting design and language was unclear, which caused admins to use incorrect settings. In light of the Cambridge Analytica data breach, the sensitive nature of audience targeting required my team to go through multiple privacy and legal reviews. The content strategist and I ultimately landed on a more intuitive solution that was also compliant with new policies. Posting rate increased by 0.36%, around 10.51K posts/day. Improved relevancy and Meaningful Social Interactions also benefitted consumers who saw Page content that was published using these features. 60% of all Facebook posts from Pages contain photos or videos. Despite the majority of posts with media only containing one photo or video, all 5 format options, including photo album and slideshow, are exposed in the composer every time someone tries to add a photo to their post. I designed a solution that removed friction from creating media posts by pulling forward upload step, defaulting to the standard media composer and showing other format options only when 2+ photos uploaded (3+ for slideshow). Flow of control experience: Before uploading a single image or video, Page Admin must select a format. Prototype spec of Conditional Photo Chooser test. An earlier version was tested in customer research and led to some language improvements. The results of the test were surprisingly flat. The primary lesson from this experiment is the commitment Page Admins have when posting. Having an extra step in the flow did not in fact discourage them from posting. 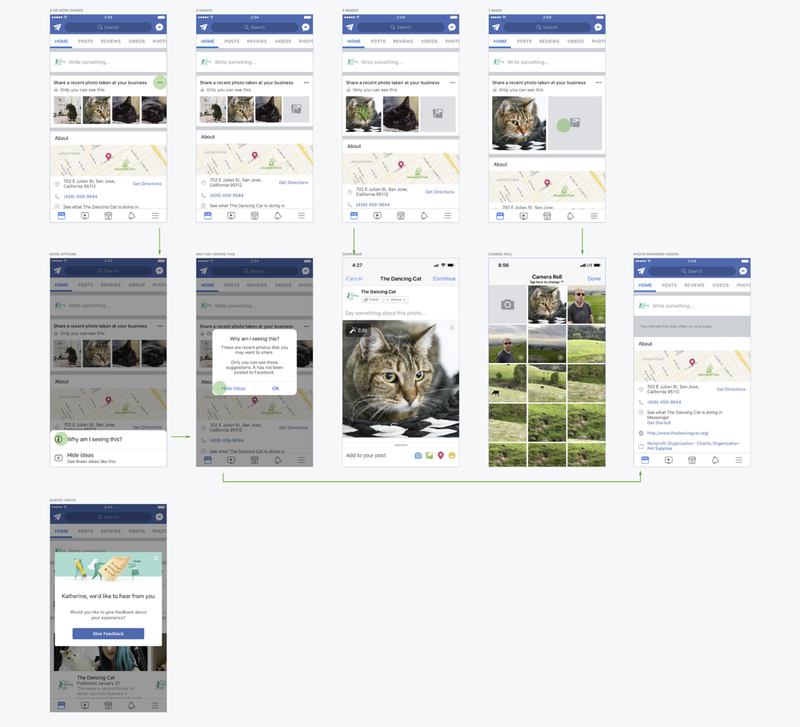 While the conditional photo chooser provides a simpler and better experience, it also hides some advanced features which could be valuable to some Page Admins. To better analyze, the team discovered that we needed to add logging to the carousel and canvas features. This was an important learning for me to verify that logging is in place prior to launching a test.